On February 5, 2015, the Ontario Government rolled out new legislation that specifically targets Child Performer’s employment rights in the entertainment industry. CanadaFashionLaw has followed a movement that has been happening south of the border in terms of protecting child talent, and is delighted that Ontario is also taking the necessary precautions to protect talented youth. However, it appears that the Ontario government did not specifically consider fashion models, much to CanadaFashionLaw‘s disappointment. Who does it pertain to? The act pertains to child performers under the age of 18, who perform work or supply services as a performer (including a background performer) in the entertainment industry for monetary compensation. However, the act stipulates that an employer cannot employ a baby less than 15 days old for recorded entertainment or a child that is younger than 2.5 years old for live entertainment. What is the legislation applied to? The legislation is limited to the live and recorded entertainment industry. What is included as part of the entertainment industry? The scope of what qualifies as part of the entertainment industry is restricted to performers in: a) live performing arts in theatre, dance, music, opera or circus or b) visual or audio visual recorded entertainment that is played in cinemas, the internet, radio, television broadcast, or a recorded device, such as a DVD. An obligation of full and continued disclosure. Prior to employing a child performer, the prospective employer must have a meeting with the child’s parent/guardian providing full disclosure about the gig, including a description of the role the child will play, the location and hours of the rehearsals and performances, any health and/or safety hazards the child may be exposed to, the precautions the prospective employer will take to safe guard against those hazards, any special skills required of the child and any special effects that the child may be exposed to. The child has the option of being present at this meeting. Should any of these items be changed, the employer must provide the parent/guardian with written notice. The changes cannot be implemented without the parent/guardian’s consent. Written employment contracts are mandatory. Although fantastic that this is included, CanadaFashionLaw doesn’t understand why anyone would provide services without a written contract. Supervision. Any child performer under 16 years ago must be accompanied by an authorized chaperone to/from the workplace. The parent/guardian must provide its authorization in writing. However, if the travel is overnight, the parent/guardian must accompany the child at all times. The employer is responsible for the overnight travel costs. A parent/guardian or authorized chaperone must be present during the child’s performance. Tutoring. The employer must set aside time in the work schedule for the child to receive tutoring. Creation of trust fund. If the child earns more than $2,000 on a project, 25% of the earnings must be set up in a trust fund, which the child can access when he/she reaches 18. However, if the child is part of a trade union or professional association, and the union/association provides for a trust fund deposit, this provision does not apply. Maximum hours of work and overtime. The legislation sets the maximum hours and overtime a child can work in the day, which varies according to age and whether the child is performing in live or recorded entertainment. Free hours. The legislation also stipulates that the child must have a specific number of minimum hours free during the work day and also during the week. Enforcement. The act refers back to specific provisions in the Employment Standards Act with respect to enforcement. Interestingly, (but perhaps not surprisingly), the fashion industry does not easily tie in with this legislation. It appears to be geared towards Ontario’s golden child entertainment industries: film, television, radio and music, with a few additional industries, such as dance, opera, theatre and, even the circus. Fashion is not itemized as an industry. As such, it is difficult to make the case that child models will be protected by this legislation. At best, child models may be protected under this legislation if they are included in a recorded commercial that is replayed in cinemas, on the internet or on TV. Frustratingly, this is another example of how the Ontario government has shortchanged the fashion industry (perhaps to the employers’ delight). We wish to draw your attention to an important issue that is occurring right now that affects the fashion industry and ask for your support. In 2014-2015, the Ontario Ministry of Tourism, Culture and Sport invested approximately $800 million into the province’s cultural industries. To date, the fashion industry has been ineligible to receive any of this funding on the basis that it does not qualify as culture or arts. Ashlee Froese, a fashion lawyer who is a Bay Street partner, co-chair of FGI, and a mentor with TFI and CAFA, is filing submissions to the Government of Ontario advocating that fashion should be eligible for government funding. A number of entities and individuals have officially endorsed her submission, including the Toronto Fashion Incubator, Fashion Group International, the Canadian Arts and Fashion Awards, Lisa Tant, Jeanne Beker, Stylist Box, Sue Roadburg, David Dixon, Suzanne Rogers, Deirdre Kelly, Paul Mason, Robert Ott, Sabrina Maddeaux, Ryerson Fashion Zone, Mikael D, Novella Magazine, Toronto Men’s Fashion Week. We believe that mass support from within the fashion community will help get the fashion industry noticed. We invite you to familiarize yourself with Ashlee’s submissions, which can be accessed here: Ontario Culture Consultation. If you support this position, please sign the petition which can be accessed here. The deadline is December 7, 2015. This submission has been endorsed by the Toronto Fashion Incubator, Fashion Group International, the Canadian Arts and Fashion Fund, Lisa Tant, Jeanne Beker, Suzanne Rogers, David Dixon, Paul Mason, Sue Roadburg, Dierdre Kelly and Stylist Box. Last week, CanadaFashionLaw advised its readers that the Ontario Government is conducting open consultations with respect to setting up a Culture Strategy for Ontario. Fashion is not included as part of culture. One of CanadaFashionLaw’s mantras is: don’t ask, don’t get. With respect to the consultation, our position is that if you don’t like the status quo, change it! (And if you want our help to change the status quo, let us know!). Ultimately, industry has to inform the government of the realistic ‘boots on the ground’ business impact that laws have. There’s always an interesting dance between industry and the government. Oftentimes industries flourish when it has government support. When industries don’t have that support, industry players will band together to lobby the government to make laws more favourable. Statistics on whether the Canadian fashion industry is very involved in lobbying the government for progressive change is sparse. Sometimes this is on purpose as corporations are hesitant to demonstrate their overt influence on the government. Examples in the US of where the fashion industry has actively lobbied government to change laws include attempts to change the US Copyright Act to include specific protection for fashion designs and to build support for the Trans-Pacific Partnership. If you’re wondering why the fashion industry would have a vested interest in the TPP – the TPP will eliminate tariffs of textiles and apparel. (Of course, this could put a major dent in the ‘Made in America’ movement). In 2015 alone, the US fashion industry spent big on this issue. For example, the US National Retail Federation spent $3 million on lobbying the US government, Target spent $770,00, JC Penny spent $410,000 and the Gap spent $160,000. That is some significant investment! It will be interesting to see if the Canadian fashion industry will band together to get the Ontario government to consider fashion to be part of culture. If you’re interested in chatting about this more, feel free to reach out to CanadaFashionLaw. Sometimes CanadaFashionLaw gets so excited about information it gains that will help out designers that we just can’t keep it to ourselves! Allow us to introduce you to the “DHL Exported Program”, which arose out of a collaboration between DHL and IMG. Created in 2014, the purpose of the program is to assist emerging designers, who have had traction domestically, to launch their brand globally. The Program is eligible to designers worldwide who wish to participate in a fashion show in one of four key markets: the US, the UK, Italy and Japan. The winner will receive assistance in creating its export development strategy, marketing and public relations support and sourcing and shipping fabrics/supplies. Of course, the real carrot is for the designer to be included in a runway show in New York, London, Milan or Toyko. In addition, the designer will be provided with an on-site stand for buyers, media and attendees to place orders for the runway pieces. An on-line portal will also be created to facilitate international purchases. Canada’s own, Sid Neigum, was the winner in the second cycle and will be showing in London. If you’re interested in more information, go to www.dhlexported.com for details. As a fashion lawyer, I understand the importance of the interplay between government support and the legal framework in order for industry to flourish. The fashion industry is no exception. An opportunity has presented itself that I felt important to bring to your attention. The Ontario provincial government is creating a Culture Strategy for Ontario. This is a first for Ontario, which is fantastic. However, there is an important omission: the fashion industry is not included as part of ‘culture’ or the ‘arts’. Creating the Culture Strategy for Ontario is in its infancy and the government wants your input. As such, the Province will be conducting a series of consultations to ensure that the Culture Strategy of Ontario encompasses and impacts what is important to Ontarians. There is a lot at stake if fashion continues to be excluded as part of ‘culture’ and ‘arts’. In 2014-2015, the Ministry of Tourism, Culture and Sport’s total spending on culture was $800 million. Now is our opportunity to ensure that fashion is included in the budget. The fashion industry is a significant contributor to Ontario’s culture and economy; but, unfortunately it is up to the fashion industry to prove that it deserves to get a piece of the pie. If you would like to get more information, visit the Culture Strategy’s website at Ontario.ca/culturetalks. attend a public town hall meeting, which will held at various cities throughout Ontario. The Toronto town hall meeting will be held on November 12 from 7pm to 9:30pm at Currie Hall at the National Ballet School. (For other cities, please go to Ontario.ca/culturetalks for details). H&M Sues Forever 21? Beach please! There is no doubt about it – there is a stark similarity between the designs. H&M, which professes to be the second largest global clothing retailer, first sold its BEACH PLEASE tote bag in the US in April 2014. As of July 2015, it sold thousands of BEACH PLEASE tote bags globally. H&M formalized its copyright to the design by securing a copyright registration, which was granted on June 12, 2015. H&M alleges that Forever 21 subsequently commissioned a Chinese-based manufacturer to produce infringing designs, which were sold globally. 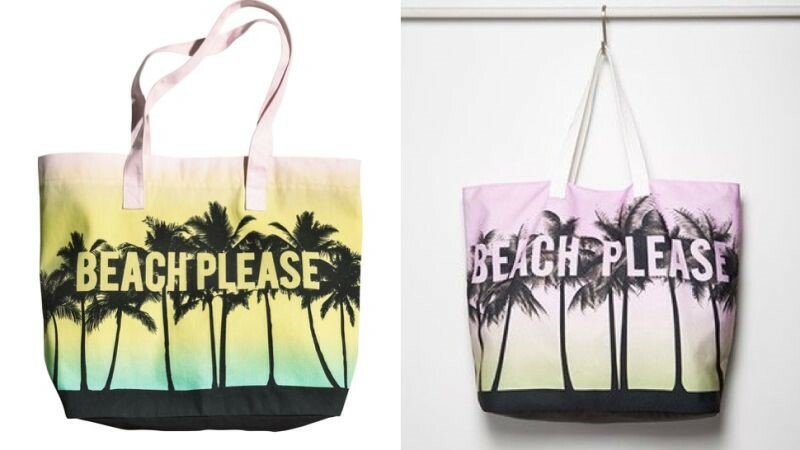 H&M has reason to believe that Forever 21 has profited substantially from sales of the BEACH PLEASE tote bag. inducing others to commit infringing acts. H&M’s graphic is subject to copyright protection. Forever 21’s graphic is substantially similar, if not virtually identical, to that of H&M, thereby constituting copyright infringement. The graphic is non-functional, inherently distinctive and has acquired secondary meaning. As such H&M asserts that the BEACH PLEASE design functions as trade dress; Forever 21’s unauthorized use of the BEACH PLEASE logo constitutes trade dress infringement. Forever 21’s unauthorized use also constitutes a false designation of origin. Moreover, Forever 21’s unauthorized use constitutes an attempt to pass off its products, constituting statutory and common law unfair competition against H&M. What is interesting to the fashion law community is that H&M and Forever 21 are notorious defendants in the fashion industry. In fact, H&M takes note of this trend with respect to Forever 21 stating in the Complaint: “[Forever 21] has also been accused of copyright violations in the past”. So to a large extent, we have the kettle calling the pot black. However, it is interesting that they are now warring amongst themselves. Perhaps it is karma; perhaps it is just business. Nonetheless, in this instance the magnifying glass is focused on Forever 21. In the fashion law community, Forever 21’s disregard for intellectual property rights and propensity to resolve matters outside of litigation has some wondering whether this is all a part of its business strategy. It may simply be cheaper to pay an undisclosed settlement sum to the designer rather than sourcing new designs or paying licensing royalties. It would not be shocking if this case settled, but it sure would be interesting if it did not! Today was a busy day for CanadaFashionLaw. In the morning, she presented at the Ontario Bar Association on social media law. At noon, she was the guest of a radio show hosted by 360STRM.com and was talking about her road to becoming a fashion lawyer. And she still managed to do it all in heels! CanadaFashionLaw previously advised on Canada’s new anti-spam legislation “CASL” (click here). Within a year of the legislation’s enactment, we have our first decision. This shows that companies really should pay heed to CASL and ensure that it is in compliance with its provisions. Below is a summary of the decision against Plentyoffish Media Inc. (“Plenty of Fish”). Plenty of Fish sent commercial electronic messages to registered users of its online dating service. The unsubscribe mechanism was not clearly or prominently set out in the e-blasts. In addition, the unsubscribe mechanism could not be readily performed. The purpose of the e-blasts was to notify the Plenty of Fish subscribers of all the services that were available. The violations occurred between July 1, 2014 and October 8, 2014. Plenty of Fish was hit with a significant fine: $48,000. In addition, Plenty of Fish was required to undertake that it would develop and implement a program that ensured compliance with the anti-spam legislation. This included training and education for Plenty of Fish’ staff and the creation of corporate policies and procedures. It is with great excitement that we announce that CanadaFashionLaw has moved firms and has joined Fogler Rubinoff as a partner, where she will continue to practice branding and fashion law. If you want to get the lowdown on Fogler Rubinoff, check out its website here. A little strapped for time? Here’s the skinny on the new firm…it’s a full service, mid-sized firm based in Toronto and Ottawa. What does this mean? Basically it means that whatever your legal issue, we’ve got you covered: intellectual property, corporate, commercial, tax, labour/employment, litigation, wills, estates…we can service your business from cradle to grave. And you know the best thing, the firm has free homemade cookies available everyday!!!!!! If you’d like to come check out CanadaFashionLaw‘s new digs or come talk all things fashion over a delicious cookie, feel free to reach out at afroese@foglers.com. If your business is online and uses social media as part of its customer service/marketing strategy (and let’s face it, whose isn’t), you may be interested in a book that was recently released by Lexis Nexis. It’s a handy book that sets out the legal issues that can arise (stemming from creating social media policies, employment issues, domain name disputes, privacy considerations, and e-commerce). CanadaFashionLaw was delighted to be a contributing author for this text book. If you’d like to get your hands on a copy, click here.